All throughout Costa Rica, if I’m riding in a car longer than 15 minutes, I pop Dramamine like Smarties out of a Halloween pillowcase. Why? You ask? Because I like the taste, want an excuse to sleep, or heard that it gives you powers of telepathy?!!! Nope. After ditching my sedan in Seattle back in 2008, my motion sickness tolerance has dwindled down to zero. It’s front seat/windows down for me, or puke party for everyone else. To put icing on the cake of said party, many of the roads in CR seem as if they recently hosted a parade for the Olympic Jackhammer Riding Team (sponsored by Trits). Potholes, gravel, streams, small ponds, and unpaved dirt-rock is where it’s at, peeps. The lack of a functioning railroad system pushes trucking as the #1 means of transporting goods about the country, damaging the any newly-paved asphalt along the way. Rastabici - I snapped this one in Puerto Viejo by the beach. Breakfast in the basket! Another interesting fact I picked up from my Tico hosts, is that cars cost DOUBLE* the price they do in the USA; apparently the import taxes are enormous. So, as I mentioned before – not driving is not a lifestyle choice, most residents take the bus, walk, or ride bikes because. Insurance will put a hole in your pocket like the potholes put a hole in your tires. And gas isn’t cheap either – at least 60 USD to fill the tank on our loaner Toyota Rav4. The bus is a steal, about 50 cents a ride in town, and for about two US dollars you can take the express bus all the way to the capital of San Jose… But what about the bicicletas in Costa Rica? 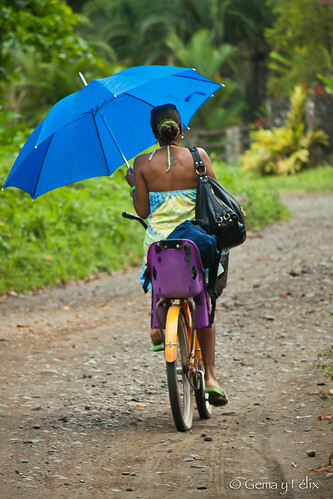 Woman on a bike in Quepos, CR - image courtesy of Boston Gringo flickr. Survey says that bike commuters clearly comprise at least 27.934%* of the 70,000+ people here in Turrialba! Regarding advocacy, in the capital of San Jose, cyclists have rallied for more bike friendly infrastructure mirroring the movements in Mexico and Guatemala. The local advocacy group called ChepeCletas sought the help of the Embassy of the Netherlands (the two-wheeled riders of the North) to organize a friendly event of 400 cyclists around the capital in April 2012. Overall, Costa Rica is home to several species of Cyclesauruses: ladies on bikes with umbrellas, serious Orbea-riding roadies, old abuelitos riding equally old junkers, rastas on cruisers at the beach, kids bouncing on BMX bikes with pegs, and MTBs galore. Here, the endangered specimen is the skinny-jeaned hipster skidding tributes to the Costa Rican equivalent of Joseph Gordon Levitt. Behavioral patterns differ by region, but general preferences include front baskets, unlocked bikes for short stays, lights and reflective suspenders, and the occasional helmet around your wrist (strange, I know – but let’s not get into that debate again). The lock of preference is a piece of heavy-duty chain and a keyed padlock. Just more proof that any bike can be a great commuter. Beach cruisers 'n' baskets - no helmets, no locks - in Puerto Viejo, image courtesy of Jem Kuhn flickr. As bikeless we may be for the time being, boyfriend and I have been getting around by foot until I can get my paws on my friend’s cousin’s neighbor’s sister’s banana seat bike (if my Spanish translation is correct, I think that’s who I’m waiting on). We are staying up a pretty steep hill, about a 25 minute walk from town. Oooh, my legs would be in killer shape with this daily climb! Our “hill” is known as Volcan Turrialba – apparently she’s legit – since today we saw MTB riders barreling down the hill during “the world’s toughest mountain bike race” – La Ruta de Los Conquistadores. I should’ve entered the race and brought a folder in my checked bags (hint, hint!) Well, there’s always next year! Hasta Luego, Cycle Ladies and Gents! Great overview! I’m surprised we haven’t heard more about the cycling scene in Costa Rica, especially when the percentage of commuters is so high. Any word on commuter levels in the capitol city? No real statistical value, Ghost Rider! But it’s true, at least, here in Turrialba that I see a lot of folks NOT in cars – the lack of parking in the main part of the city due to it’s small old-towny size too. Everyone is on foot, on a bike, or in a bus, on a motorbike. Great write up. How long will you be there? increible hermana! 27% commuters – CR rules. good luck riding with all those potholes – is it worse than waialae and kapahulu?! I should be here til Navidad, RL! @Keebies, potholes are at least as bad as riding down Waielae! I was picking up my wife’s cousin (an Englishman living in Fortaleza, Brazil) at SFO last year and we were chugging back down the 101 to our house, catching up on the family news, when he asks “How much did you pay for this car?”. It was a 2008 Honda Fit, nothing special, so I told him. He says “Do you realize that in Brazil, this is a $30000 car?” Having studied Brazilian history somewhat and having visited him down there not too long after buying the car, I had an idea it would be more expensive, but not double. Hey i just returned from a 6 month vacation in Costa Rica! this article is sooooo true to what i just experienced on my trip.